Once the nights get colder, we’re sipping warmer beverages like hot chocolate. And what’s better with hot chocolate than marshmallows? Specially if they are Homemade Cacao Nib Marshmallows! You know the kind of person that drinks hot chocolate whether it’s 30F or 95F outside? That crazy person that can leisurely sip on hot cocoa while sweat trickles done their forehead? Yeah, I’m that lunatic. Living in New England, specifically Massachusetts, I have yet to adapt to the “iced coffee, all the time” mindset. And actually, I don’t think I ever will – my love for hot coffee and other beverages is steeped deep in me. So, to pretend to be as normal as possible, I waited to share these Cacao Nib Marshmallows until the weather cooled down – even though I made these in August, along with the pictured hot chocolate. But now it’s appropriate, since the weather is down to under 50F during the nights here on Martha’s Vineyard and the only person that dares to step outside is M., because he apparently loves to grill in cold weather. It must be the Cape Coder in him! 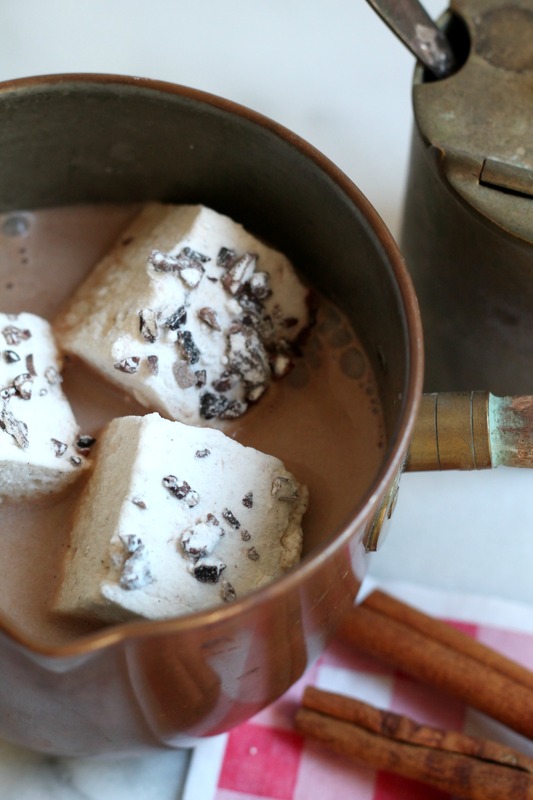 While he grills dinner, I’m sipping on some hot chocolate and reading a book; while he sweeps the deck, I’m sipping on hot chocolate dotted with these Cacao Nib Marshmallows. Fear not! Marshmallows are super simple to make and can be adapted to any favorite flavor you have – seriously, stop buying those squishy bags at the store that are devoid of flavor and step up your mallow game by making these marshmallows. They make the perfects dibble gift idea and even as a cute hostess gift in a mug. Let me know in the comments: what type of marshmallows will you be making this fall/winter season? The perfect marshmallows with a hint of chocolate from the cacao nibs. Lightly grease an 8 by 8 inch baking pan and set aside. In a stand mixer bowl, hydrate the gelatin with the cold water for 5 minutes. Meanwhile, in a small sauce pot, heat the sugar, corn syrup, and water #2 until the syrup reaches 240F. Slowly pour into mixer and start whipping at medium high speed for 10 minutes, then turn to medium speed for 10 more minutes. Add salt and vanilla extract. The finished product will be fluffy, opaque, and tripled in volume! Pour fluff into greased pan, smoothing the top as you go. Top with a sprinkling of cacao nibs and a dusting of powdered sugar. Let sit overnight and proceed to loosen the marshmallows with a greased knife. Cut into squares and toss in more powdered sugar. Serve with hot chocolate! Basic marshmallow recipe from Marshmallow Madness by Shauna Sever. Confession time. I’m never going to make these marshmallows, but your pictures look good and I love hot chocolate! Ha – I’m never going to be making marshmallows either but I love this post!